Seasons change but there’s always FUN at Bob’s! Mark your calendars and join us for some great events at Bob’s. Check the website calendar regularly for updates. If you do not already receive our email notifications on events, news, sales, and more, sign up NOW. 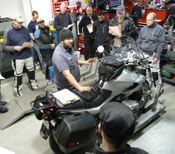 Ride in and join fellow riders of all brands explore exciting topics with Certified BMW master techs, and product vendor reps. Learn how things work, get explanations and answers to all your questions, while enjoying a hot cup of coffee and delicious donut! Sessions (and coffee and donuts!) are FREE. Click below for details on each topic and to RSVP! Better Understand Your Insurance Policy, What It Covers, And How You Can Save! 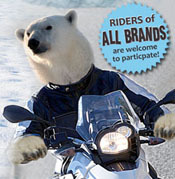 Join Bob’s first annual High Mileage Polar Bear Challenge. All brand riders are encouraged to join in the fun and all you have to do is ride…it’s that simple! Round 3 is now open for registration and we encourage you to join in the fun, it’s not too late and you too could be a winner! Currently we have 26 riders on all brands—Harley’s Suzuki, Honda, Yamaha, and Kawasaki—not just BMW’s signed up (let your friends know you do NOT have to ride a BMW to participate! Participants are traveling from near and far to register–New York, New Jersey, Pennsylvania, Delaware, and Virginia! Get your heated gear on, fill your tank, and join Bob on president’s day for a ride to Camp David. Although we won’t be granted access to tour the facility, the scenic route Bob has planned through the mountains of Thurmont should be just as exciting! Arrive at Bob’s BMW by 9:30 with a full tank of gas, grab some coffee and donuts, and then depart at 10 a.m. sharp. Bob will find a nice place to stop for lunch and then the group will head back with the option to follow Bob back to the shop or take their own route back home. Bring a friend and RSVP in advance. Depending on weather and the level of interest (8 riders or more) Bob’s reserves the right to cancel the scheduled ride. Spread the word and join in the fun! Polar Bear participants, this is a great way to rack up some extra miles! Your mission during the month of March is to ride your motorcycle to specific ARTsites throughout Howard County, take a selfie at each ARTsite wearing your riding gear (see details below), send that image to hanna.creekmore@bobsbwm.com, and get entered to win one of SIX gift certificates to great local Howard County restaurants! Pick up a “Road to the Arts” map at Bob’s BMW. Maps will be available by coffee. visit the better your chances are of winning! Take a selfie in front of each sculpture, wearing your riding gear. Get entered to WIN gift certificates to local Howard County restaurants. Three $50 and three $100 gift certificates will be awarded. $50-$100 restaurant gift certificate to a great Howard County restaurant! $50 restaurant gift certificate to a great Howard County restaurant! Participants must send ALL pictures within ONE email AFTER visiting the last site, to hanna.creekmore@bobsbwm.com by 11:59pm (EST) March 31. Each picture must include yourself in riding gear (helmet in hand so we can see your face) and the sculpture. 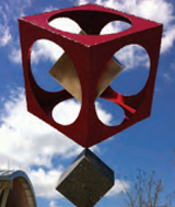 Visiting the same sculpture twice does not count. You do NOT have to visit all the sites in one day. You can visit the sites throughout the month. You do NOT have to ride a BMW to participate! For this viewing, in addition to giving a stunning photographic overview of his incredible ride through Mexico, Central and South America, this installment will focus more on the logistical and technical aspects of the “how, what, why, when” of not just surviving, but thoroughly enjoying long distance world travel on a shoestring budget. *Please note: If you caught the first one, consider this presentation “Part II” in the series, but…. even if you didn’t catch “Part I”, this event will still be a great way to get inspired to start (or continue!) your own moto- journey. This is an absolute MUST SEE for the GS set, but the topics discussed are equally aimed at ALL riders, skillsets and backgrounds. Stay tuned for more details on this event. All brand riders are encouraged to join the fun so mark your calendars now or set a reminder in your phone for Bob’s biggest event of the year, its annual Spring Open House! FOOD, PRIZES, ONE-DAY SPECIALS, VENDORS, AND LOTS OF FUN! Back by popular demand, the motorcycle DYNO! New this year, on-site food trucks like WOLO Food, “Food that Rocks!” offering great variety of delicious foods and desserts! Do you have a product or service that you believe would interest hundreds of motorcycle enthusiasts? Interested vendors can email hanna.creekmore@bobsbmw.com for more details on vendor opportunities.